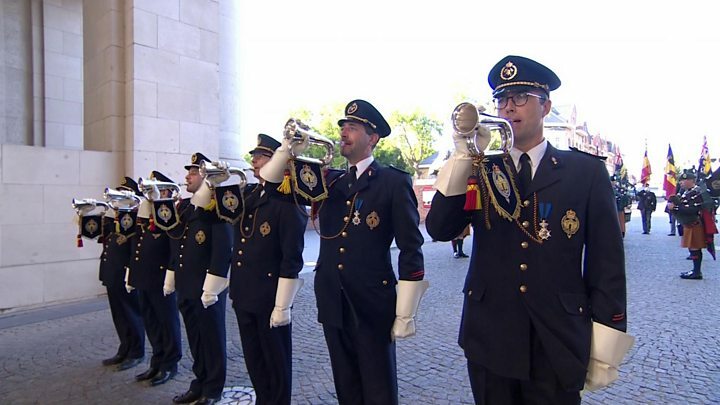 The "courage and bravery" of those who fought in one of the bloodiest battles of World War One has been remembered, 100 years after it began. Prince Charles, Prince William and Prime Minister Theresa May were among those who paid tribute to soldiers who fought at Passchendaele, in Belgium. 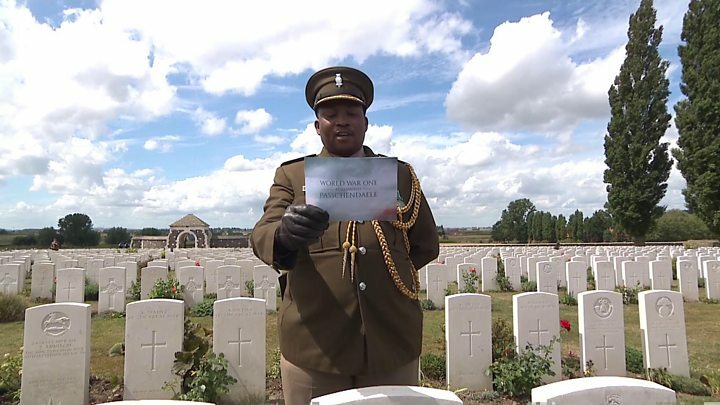 Some 4,000 relatives attended the ceremony at Tyne Cot cemetery, Ypres. In the three months of fighting, half a million Allied and German soldiers were killed, wounded or went missing. Prince Charles addressed the service, saying: "We remember it not only for the rain that fell, the mud that weighed down the living and swallowed the dead, but also for the courage and bravery of the men who fought here." The conflict - officially known as the Third Battle of Ypres - was fought from 31 July 1917 until November that year. It was not only infamous for the number of casualties but the mud. Many drowned in the thick quagmire, caused by weeks of relentless rain. Descendants secured tickets to the event at the cemetery in a ballot run by the government. Former England rugby captain Lewis Moody visited Tyne Cot to pay tribute to his mother's great uncle, who is commemorated there. The 39-year-old told the BBC News Channel it was so "hugely moving" that he broke down in tears when he found his relative Ernest Lovejoy's spot. "The brutality and the blood and the sacrifice that happened here is replaced with beauty, serenity, peace and calm," he said. Asked about the desire of young men wanting to sign up, Mr Moody said you just "could not comprehend it now". Bill Rhodes, whose great great uncle William Rhodes died 100 years ago on the first day of the battle, said it was "very important" for him to be at the ceremony. "I don't think anyone can actually appreciate how horrific it was," he told the BBC News Channel. "I think the conditions were unbelievable and looking at what the guys had to fight in... the rain, the mud. "It is a very nice July day, but 100 years ago today it was very, very different." During the service, military personnel and descendants read out letters and diaries from soldiers who fought at Passchendaele. An account by Private Bert Ferns, of the Lancashire Fusiliers, who fought in the battle, was read by Fusilier Shaun Mclorie. He said: "I staggered up the hill and then dropped over the slope into a sort of gully. "It was here that I froze and became very frightened because a big shell had just burst and blown a group of lads to bits; there were bits of men all over the place, a terrible sight, men just blown to nothing. "I just stood there. It was still and misty, and I could taste their blood in the air." BBC iWonder - How did Harry Patch become an unlikely WW1 hero? The Duchess of Cambridge laid flowers at the grave of the Unknown Soldier and Prince Charles and King Philippe led the laying of wreaths at the cross of remembrance. The ceremony ended with a fly past by the Belgian air force in a formation that paid tribute to "the missing man". Once a battlefield of liquid mud, Tyne Cot is now an immaculately maintained cemetery. 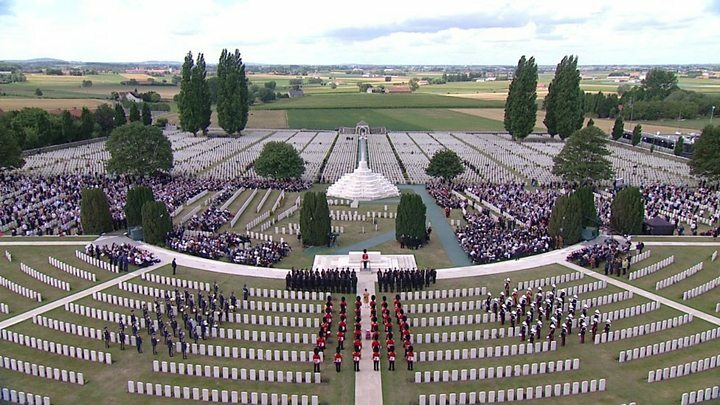 Thousands of people have gathered for Monday's service to mark the centenary of the Battle of Passchendaele, but their numbers are dwarfed by rows of pristine graves and an imposing stone Memorial to the Missing. "It has hit home, quite how disastrous the death toll was," says Ann Philips, whose uncle Edward Woolley was killed weeks into the battle, age 22, on 22 August 1917. She is wearing a white dress with poppies, as she finds her Uncle Ted's name on the cemetery's memorial, alongside 35,000 other missing soldiers. Many were a similar age to student Daniel Fay, 20, whose great-great-uncle James McBarrons was a labourer in Paisley before the war. He died aged 28. "It makes me think of my group of friends who would have been the same age," he says. 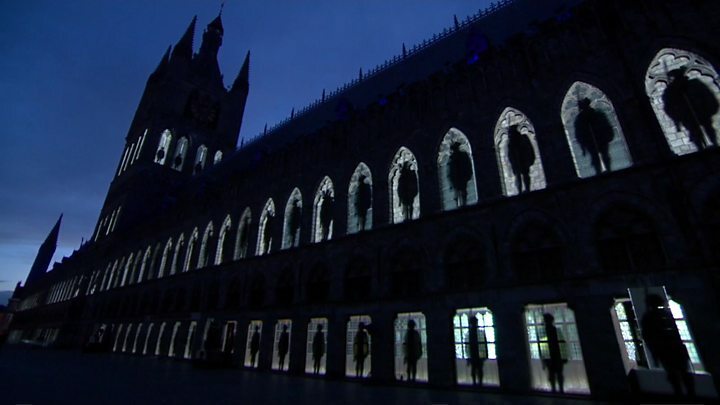 A few miles away in Ypres, the city has hosted a weekend of culture, telling stories of heroism and sacrifice in song and plays. But today strikes a solemn, more contemplative tone. Prince Charles also visited a WW1 bunker, which lies about 30ft (9m) below ground in the town of Zonnebeke near Ypres. He met the grandson and great-grandson of Company Sergeant Major Henry Hawtin of 171 Tunnelling Company - one of the men who excavated it. His grandson, retired RAF Regiment Wing Commander Pete Hawtin, 49, said: "Prince Charles was fascinated to meet relatives of a man who had physically been down there. "He just couldn't believe that men would be that far below ground and how they could survive down there and work." The Duke and Duchess of Cambridge began the commemorations on Sunday by joining the Belgian king in paying tribute to the fallen at the Menin Gate in Ypres. The Last Post was played at the end of the service at the memorial, where the names of 54,000 missing soldiers are inscribed. A bugler has played the tune at the gate almost every evening since 1928. "It was phenomenal - a proper teary moment for me," the Duke of Cambridge told Commonwealth War Graves Commission interns on Monday.